Happy Hump Day, friends! 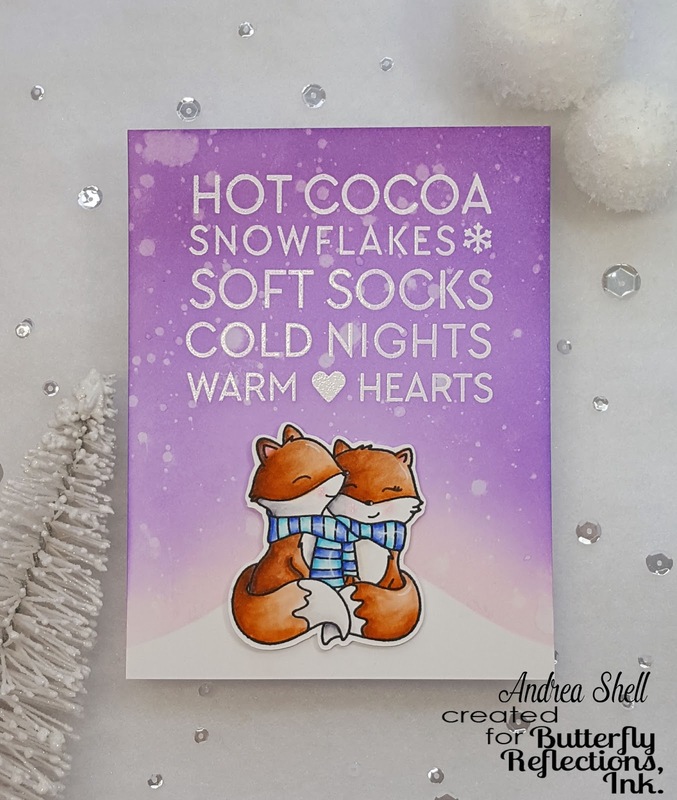 It's Andrea back with you today with the sweetest foxes ever. Check 'em out! Aren't those foxes from Neat & Tangled's Merry Kisses set too cute?! I just love how they're cuddled up together in one scarf! For a change, I started with my background first. 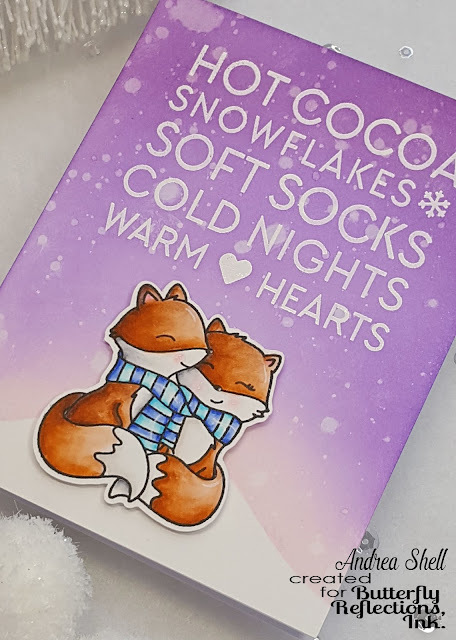 That fabulous sentiment is from Neat & Tangled's Hello Winter stamp set. Using my MISTI, I inked it up with Versamark and then heat-embossed it in white. I created the snowy hill with the Landscape Duo stencil from N&T and distress inks. I placed the stencil over some Bristol Smooth paper and ink-blended with Spun Sugar, Wilted Violet, and Seedless Preserves distress inks. After buffing the embossed sentiment with a clean paper towel to remove the excess ink, I flicked on some water and blotted it dry. While my background was drying, I moved on to those cute foxes. I stamped them with Versafine Onyx Black Ink and colored them with my Zig Clean Color Real Brush Markers. I cut them out and added some highlights with a white gel pen. 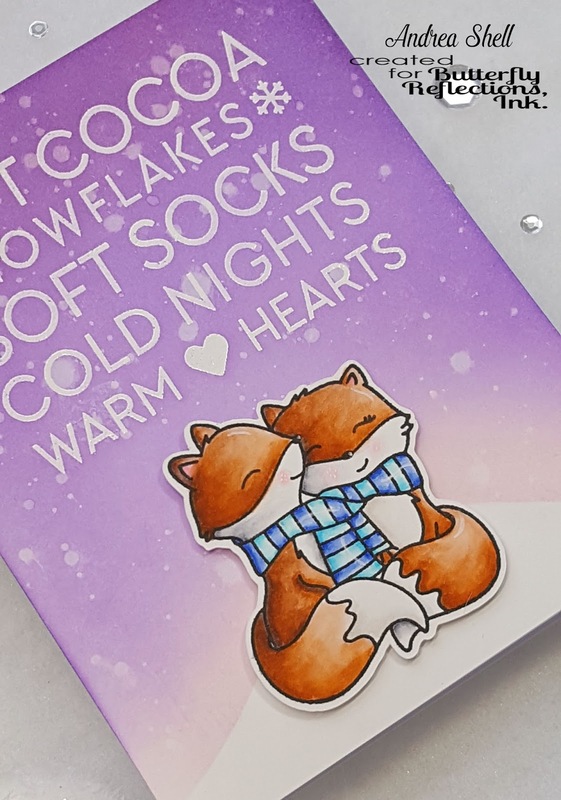 After adhering my background to a white card, I popped up those adorable foxes with foam tape and called it done. What a darling card. The little foxes are so cute. So adorable. Love the colors you used too.